Although much of the automotive world is heavily focused on tomorrow’s start of the 2013 Frankfurt Motor Show in Germany, General Motors plans to introduce their all new 2015 Chevrolet Tahoe and 2015 Chevrolet Suburban in New York City. The company (surprisingly) hasn’t issued any sort of teasers of the next generation full sized Chevy sport utility vehicles beyond the logos above – which haven’t changed at all from the current generation. First off, with GM referring to the 2015 Chevy Tahoe and Suburban as being all new, I would expect that the exterior would have a design that sets them apart from the current 2013 and 2014 model year vehicles. With the Silverado getting a facelift for 2014, I would expect to see a similar set of changes across the front end with a bigger, bolder look and sharper lines than we see on the current Chevy SUVs. Considering how the new Silverado has taken a more upscale look out front with tons of chrome, I wouldn’t be surprised if the new Tahoe and Suburban looked more like the Silverado 1500 than the 2013 model year trucks and SUVs. We can also expect some more high tech goodies up front like HID projection headlight, perhaps some LED accent lighting and matching LEDs in the taillights. 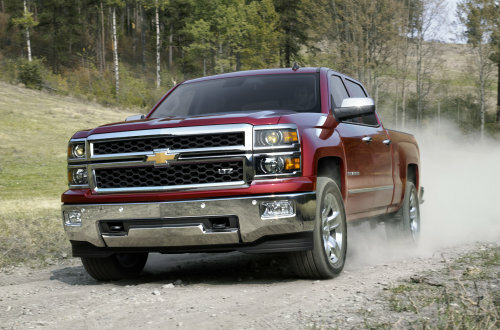 The 2014 Silverado is shown below. The next area where the 2014 Chevrolet Silverado 1500 pickup really stands apart from the previous generation is in the interior. GM went with a design that puts all of the interior controls on each side of the steering wheel in floating islands that is super unique and looks great. 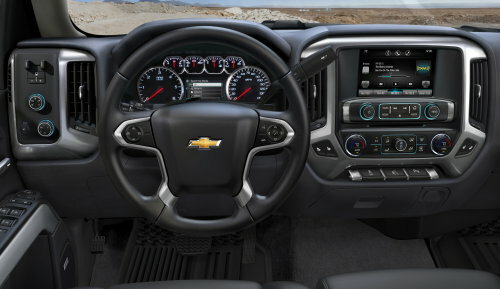 The Silverado also has a bright new gauge cluster with a driver information center and I would expect that the new Tahoe and Suburban would feature an interior layout that is very similar to the Chevy half ton pickups. One area where the Suburban, Tahoe and Silverado suffered in the past was the bland interior gadgetry layout but the new design on the Silverado – or something that resembles it – would provide a ton more interior character for the new full size SUVs. Next, the 2015 Chevrolet Tahoe and Suburban will likely (and hopefully) come with the same engine lineup as the new 2014 Silverado 1500. The current 2014 model year Tahoe and Suburban come only with the 5.3L V8 with 320 horsepower and 335lb-ft of torque so we would expect that if nothing else, the 2015 Tahoe and Suburban would come with the new 5.3L V8. This means that the power of these two big SUVs would just up to 355hp and 383lb-ft of torque when running on gasoline and 380hp and 416lb-ft of torque when running on E85. The powerful new 4.3L V6 that was introduced with the 2014 Silverado with 285hp and 305lb-ft of torque (gasoline) helps to make the new half ton Chevy pickup one of the most efficient on the market and that power yet fuel-friendly engine could entice buyers who want to avoid the fuel economy perceptions of a V8. Finally, the 2014 Silverado features a new 6.2L V8 that will deliver 420 horsepower and 450lb-ft of torque and while the largest V8 was reserved for the Cadillac Escalade in the current generation – this high performance engine that is similar to the one in the new 2014 Chevrolet Corvette Stingray could help bring more driving excitement to these big SUVs. I was impressed with the current Suburban but I was left wanting for the similar power output as what is found in the comparable Cadillac Escalade. Again, the 2015 Chevrolet Tahoe and the larger Suburban will debut this Thursday. Stay tuned to TorqueNews for a closer look at these new SUVs as they debut!